Info: Created on 3rd March 2011 . Last edited on 26th March 2011. PS: "Pray for the Disaster." - you really don't mean that. A grain doesn't make a granary but helps a friend. Thanks Adien. Good font and good feeling. Commendable and interesting. And a bold stretch of the tools too. (Even though I personally don’t think praying is the most or the best thing we can do). It's not? 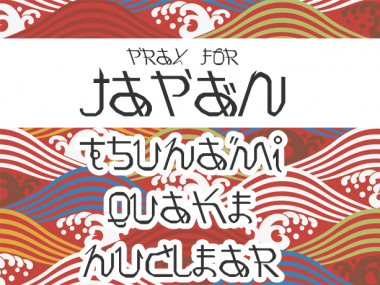 Praying will blow up the disaster! In fact, it's already blown up!